Specification for SWM’s first Trials model included Marzocchi forks and remote reservoir units, Dellorto carburettor, Grimeca hubs with quick release/cush drive at the rear, Akront rims. The Columbus cromo frame finished in red utilised an alloy bash plate between the bottom frame rails. Red and white steel tank and acerbis plastic side panels to match were complemented by opaque plastic Acerbis mudguards. 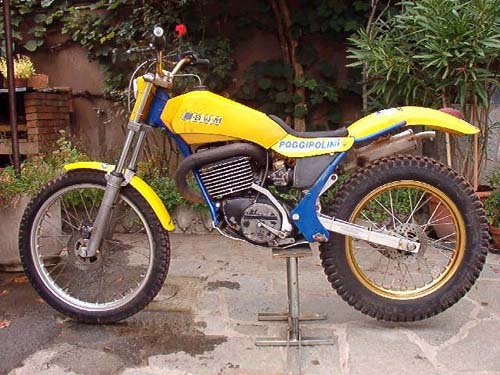 Although an entirely separate company Moto Gori and SWM had one common factor, namely SWM boss Pietro Sironi who along with Giancarlo Gori was co-owner. 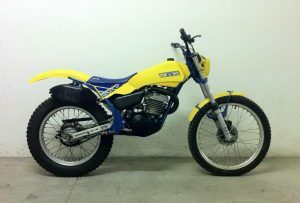 After the SWM factory launched the new yellow models in 1980, Sironi used the previous years bike to launch a trials model at Gori. The first of Goris 2 trials models was the red and white SWM painted black with a green steel tank and matching green plastics. 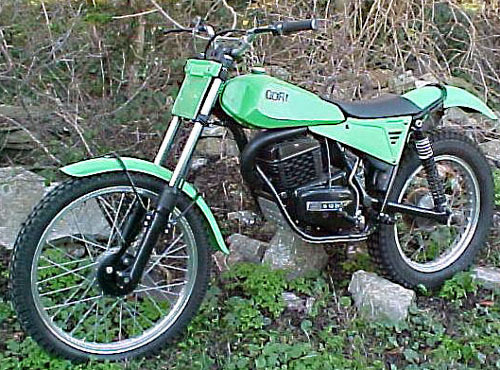 The bike was totally SWM even the new green plastics had SWM stamped into them, as did the engine cases, exhaust system, brake plates, seat etc, in fact the only Gori logo was the tank badge. The later model offered a choice of 125/200/320(called a 325!) motors and changed from Marzocchi to Betor front forks and Corte & Cosso units, before production ended in 1983. Major changes for the 1980 model saw the removal of the frames bottom rails and the installation of an alloy bash plate and replacement of the tubes around the footrest area with flat plates, which reduced the overall width. 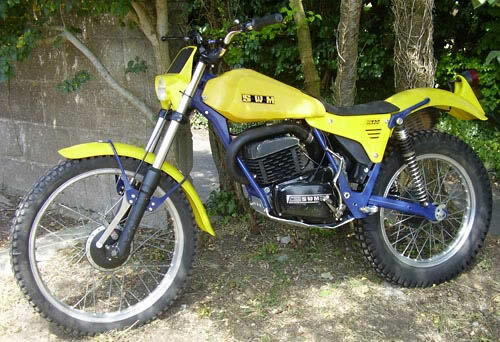 The colour scheme was also changed to yellow tank and plastics and black frame and forks. Detail changes include replacement of the rear hub with a conical Grimeca unit, Girling gas suspension and redesigned kickstart. 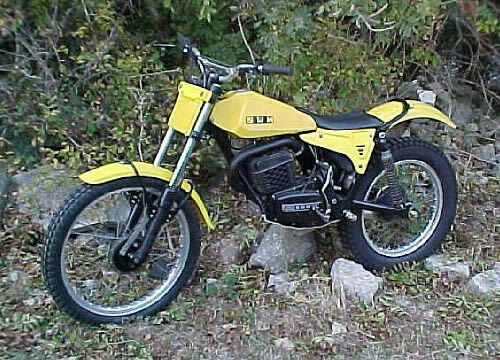 Towards the end of 1980 saw the Trials model changing to Betor front forks, the fuel tank was changed to a plastic Acerbis item (available in Italy on the previous years model). In July 1981 the factory introduced a 240 conversion kit using a 70mm barrel which could be interchanged with the 320, both models using the same bottom end. Detail changes to the late 81/82 model’s included black painted Grimeca hubs, different side panels, removal of the rear sub frame loop and redesigned triple clamps for the Betor forks. The front brake arm was reversed for a more positive feel, the seat was changed for a rubber moulded item and to acknowledge the Teams sponsorship deal with Pernod the frame was finished in blue to match their corporate colours. 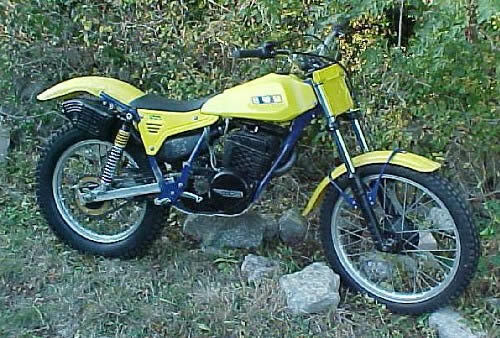 The 1983 Trials models saw the steel swinging arm replaced by a superbly crafted square section alloy item attached to Corte & Cosso units rather than the Girling Gas units of previous years. Apart from this the only visible change was the replacement of the tank with a yellow, transparent plastic Acerbis item with italic style badges. 1983 also saw the introduction of the TL350 Jumbo. The case reed valve Rotax motor was housed in an all new frame which necessitated new Acerbis plastics, new seat and a redesigned exhaust system. The Betor front forks, wheels and alloy swinging arm were shared with the other trials models, unique to the Jumbo however was the clutch lightener system. This involved a two piece cable set up and a reduction arm mounted under the fuel tank, which resulted in a much easier to use clutch than previous models. Big changes for all 3 disc valve models in 84. The motor, carb, airbox and exhaust system from the previous years bike was slotted into the updated Jumbo chassis. 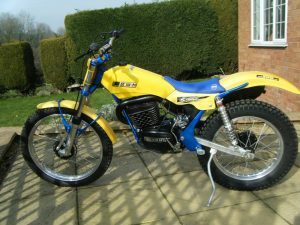 This had minor improvements over the original model, which included new 38mm Betor forks and a blue, rather than black, seat. 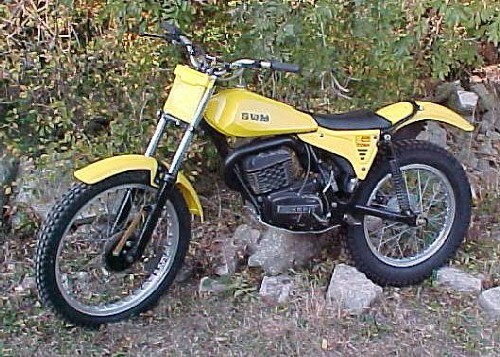 The SWM factory developed a trials sidecar in 1981, which never made it into major production. 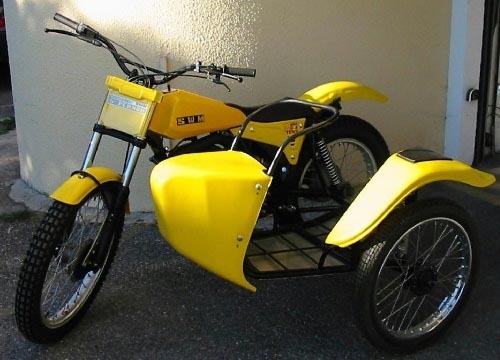 The Columbus sidecar frame had yellow plastics that were manufactured by Acerbis with SWM logos moulded into them. 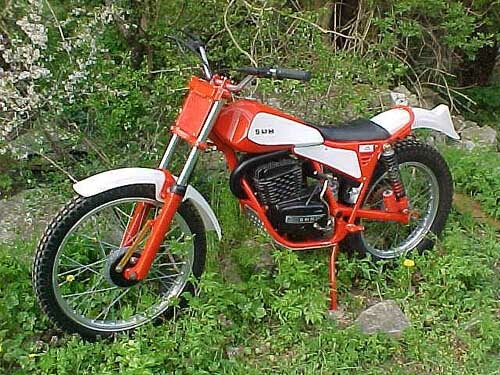 After the demise of the SWM factory in 1984 Mauro Sironi started work on his SVM trials project which utilised many of the Jumbo’s parts including frame and plastics. 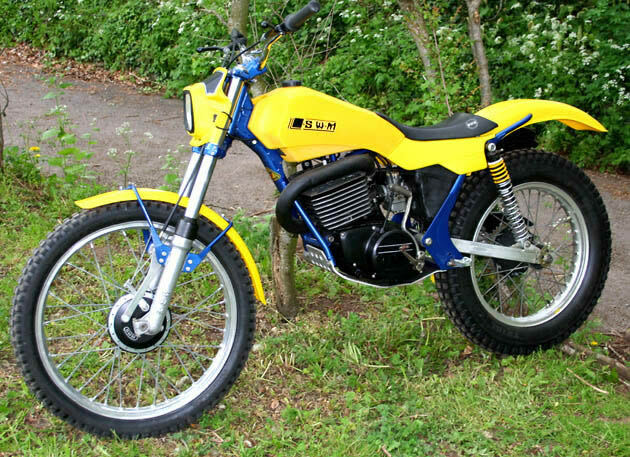 These eventually were produced with a MotoVilla engine, mono-shock suspension and disc brakes. The development work on the suspension system was carried out by Italian engineer Marco Mantovani who in conjunction with Sironi produced some experimental monoshock SWM’s.